Pearl Lam is now on Arterial! 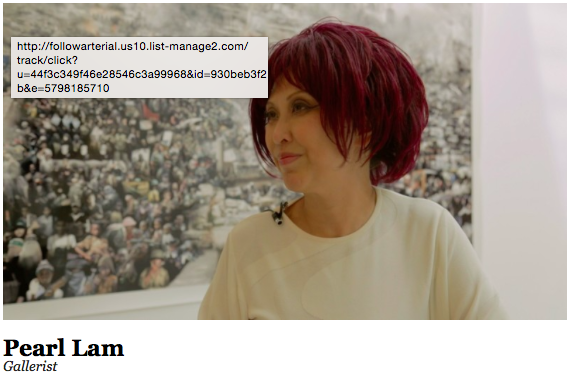 Pearl Lam has been at the forefront of reimagining China’s cultural place in the world for more than ten years through her work as gallerist, collector, patron, curator, and through the trust that she founded in 2008, China Art Foundation, whose advisory board members include the Directors of the Pompidou and Guggenheim museums. Her partners include major institutions from the BBC to the Metropolitan Museum in New York and the Chinese Academy of Fine Art, Beijing; and her proven influence extends from Shanghai through London to Singapore, where she opened a gallery in January 2014 to complement her galleries in Shanghai and Hong Kong.